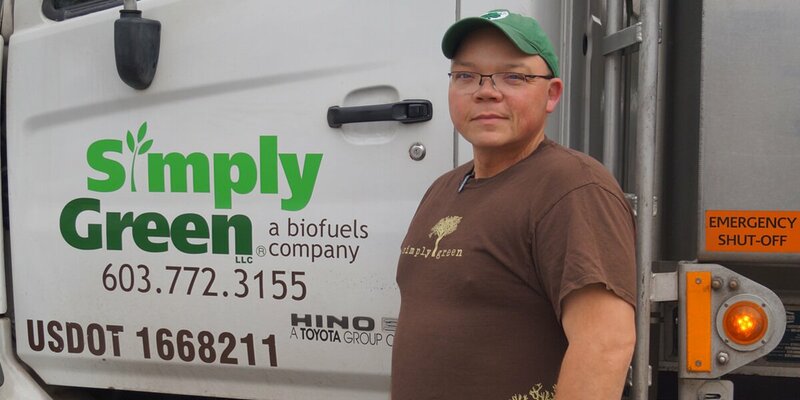 Wayne George has been delivering biofuel to Simply Green customers since the summer of 2008; always with a smile, no matter the weather. After ten years, if you ask him what he likes about his job he tells you, quickly and easily, “Being outside and driving…I love to drive.” Ask him what he doesn’t like about it and there’s a longer pause until, eventually, “I suppose being on-call and,” again a pause, “And, I wish the job were nearer home. When I started with Simply Green we worked out of Dover and that was great because it was an easy commute from Northwood where we live. Then we moved to Rte. 1 in Portsmouth and now here, in North Hampton. It’s about 45 minutes from home.” But, as ever, even the “not-so-great” is delivered with a smile. Wayne and his wife, Chris, met in High School—he was 16, she was 15—and they’ve been together ever since; they celebrated their 25th wedding anniversary a couple of years ago. For 13 of their married years Wayne and Chris have lived in Northwood, where Wayne grew up; indeed, they have lived in and around the area their whole lives. Wayne has been in fuel delivery for 18 years and before that worked for a while in railroad construction and in a factory that produced sealing strips. Chris works from home as a nurse for Anthem and home-schools their children. Neither Wayne nor Chris were home-schooled but decided they wanted to protect their own children from the more negative aspects of modern school life, “And to give them more Christian-based learning,” says Wayne. He is clearly proud of his four kids who range in age from 9 to 21. The oldest, Emily, teaches dance in Lee and Somersworth, while Connor, the second oldest at 18, is doing a variety of things before heading off to College, “He wants to go into law,” Wayne tells me. For fun Wayne and the family go to Disneyworld in Florida. They stay in the resort and “Do it all!” He admits that the Disney thing is possibly more Chris’s passion than his but, nevertheless, was more than happy to go with her when they celebrated their 20th wedding anniversary. Indeed, six years ago Wayne had his tongue and part of his throat removed in a battle that saved him from cancer. He has had to learn to talk all over again and how to eat and drink…the normal everyday things that most of us take for granted. On April 22nd when he spoke to his congregation, he was joined at the lectern by his wife, Chris, who gave the reading. Clearly a little nervous she joked that “Wayne said I wasn’t allowed to be nervous because I still have my tongue!” It’s just the sort of thing you’d expect Wayne to say. And it’s pretty evident that he hasn’t allowed the disease or its effects to define who he is. Instead, he’s all about living life, making people happy, spreading good news, and being positive. There are few guarantees in life but one thing is certain: as he heads out of the truck yard today, as on every other day, Wayne George will be smiling!